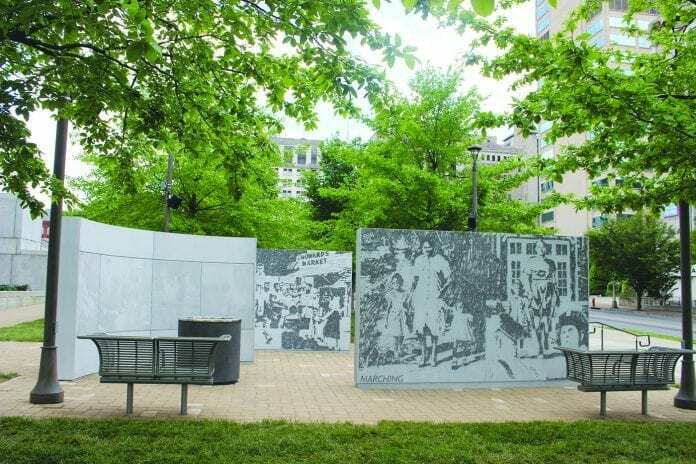 NASHVILLE, TN — Professional artist Walter Hood brings Nashville’s crucial role in the American Civil Rights Movement to light with Witness Walls. The project features images from nonviolent protests in Nashville throughout the 1950s and 60s chiseled into stone. Wood was commissioned by the Nashville Arts Commission to create the sculptures using images from the Nashville Banner archives that depict powerful moments from the movement like lunch counter sit-ins and the violent acts against the protestors. It is on display in the northwest corner of Public Square Park and marks the site where the silent walk concluded on April 19, 1960 where Mayor West agreed that lunch counter segregation should be eliminated. “This piece was perfect to begin to have a voice, a different voice, about civil rights and the story here is very different than any other place and that’s something that I wanted to record,” Wood said about the project. He spent several months researching Nashville’s role in Civil Rights, learning that it was one of the first locations in the South to be desegregated. He also said the photos of women, some who are seen marching and others protesting with their children, struck him the most. Matthew Walker III, son of late Freedom Rider and former Nashville Civil Rights Veterans Association president Matthew Walker Jr., said at the dedication ceremony for Witness Walls that his father went before the Metro Nashville City Council to say that Nashville is the “only major city of the South without a monument to the civil rights movement.” Witness Walls fills that void. He also said the wall “awakens us from the cultural amnesia,” citing the physical abuse that nonviolent protestors endured such as broken teeth and bones and having their skin burned by cigarettes. Mayor Megan Barry commended the veterans who attended the ceremony for their courage and keeping the memory of Nashville in the Civil Rights Movement alive. Wood said that many of the images used in the project were not published in the Banner, but rather used to “document the people causing trouble.” “The piece is not the definitive story of the civil rights in Nashville, it’s a prompt and hopefully it can serve as a prompt with the city to do more things and for there to be more images and more voices out in the landscape,” he said. PLEASE SEE MORE PHOTOS ON PAGE B12.